Praia da Oura (also known as Oura beach) is situated on the eastern side of Albufeira, in a neighbourhood called Areias de São João. It is very near the new centre of Albufeira, a lively area with lots of bars and restaurants. The beach is famous for its crazy nightlife scene, which makes the beach especially popular among young people. To get an impression of Praia de Oura, check out the short video below. 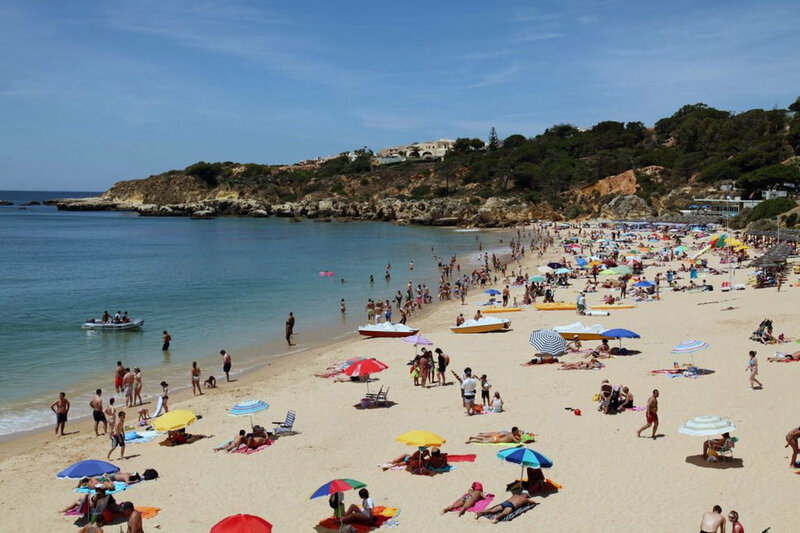 Praia da Oura offers a combination of a large beach with golden sand and red and brown coloured rock formations, just like most other beaches near Albufeira. It is a reasonable beach in size, about 900 meters long and quite wide, especially during low tide. Oura Beach is situated between Praia dos Aveiros (west) and Praia de Santa Eulália (east). When the tide is low, it is possible to walk east all the way to Praia dos Olhos de Água. The sand on the beach is soft. It feels very nice to walk on this sand. The beach is kept clean and has lifeguards (during summertime) for safety. The water quality is considered good, and the temperature of the water is not too cold. The sea generally has small waves. Be careful when swimming, because there are some small rocks in the water on some parts of the beach. On the beach you can also find some small caves and coves. Be careful inside these small caves though. It is easy to bump your head, and the sea can be quite strong around these caves. Especially during summer the beach is completely packed with tourists. This is the place to see and be seen, where you go to meet new friends. The eastern part of the beach is a bit more quiet but if privacy is what you are after, then you have to go somewhere else. There are many other beaches that offer peace and quiet. However, if you like to be on a beach full of young party peeps, Praia da Oura is heaven for you. Although the beach attracts mostly a younger crowd, the surroundings are also quite suitable for families. There are many different water sports available at Oura beach. Examples are diving, jet ski, parasailing or the banana boat. 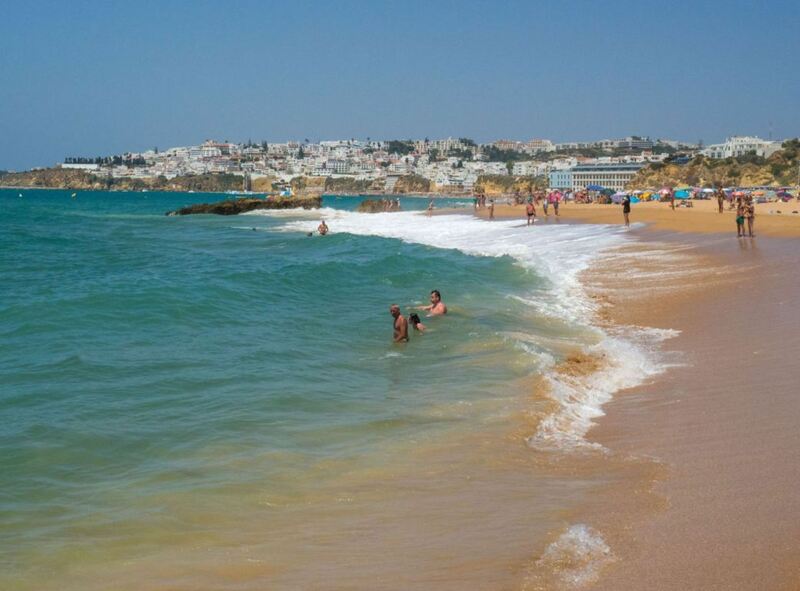 This is a perfect way to enjoy your holiday in Albufeira. If you are looking for vibrant nightlife in the Algarve, come to Oura beach. 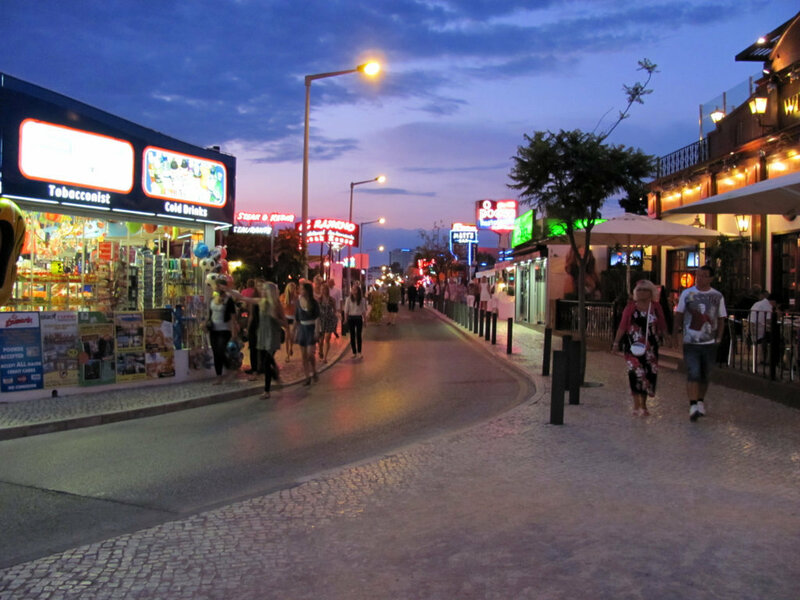 Praia da Oura comes alive at night, especially during summer months. The beach is walking distance (about 900 metres) from the famous Strip area, which has many bars and clubs. If you are looking for a good party, while enjoying relatively cheap drinks, then this is your place. This makes Praia da Oura especially attractive for younger people, looking for fun. A lot of young tourists from the United Kingdom, the Netherlands and other countries can be found here in the summer. Some bars/clubs nearby are Matt’s Bar, La Bamba, Renos, Kiss, Libertos and Pacha. Bars have a good atmosphere, usually after 11 PM. Clubs usually start filling up with people after 2 AM, but they continue until sunrise. People who enjoy the nightscene, usually start in a restaurant, then go to several bars and end up in a club. If you want to get in the mood to visit this beach, it is possible to experience the beach right now through a 360 degree picture. To get to Oura beach, follow directions to the new centre of Albufeira. In your GPS you can put the following address: Rua Ramalho Ortigão, Albufeira. The road towards the beach ends with a roundabout. Beware that parking near the beach might be quite difficult, especially during summer months. If you do not have a car available, there is also a local bus going to Praia da Oura. 3HB Golden Beach. This 3 star aparthotel has a fabulous location and very friendly staff. It offers a nice terrace with a swimming pool. It is one of the most highly rated hotels near Praia da Oura. Apartamentos Borda D´Agua. 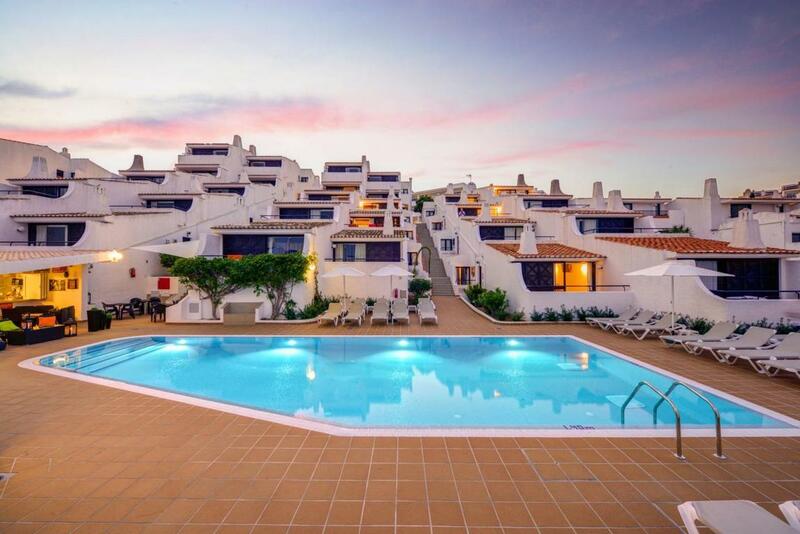 These apartments offer everything you need for a great holiday in the Algarve. Within walking distance from the nightlife area. They also provide several outdoor activities. Muthu Clube Praia da Oura. This huge 4 star resort has everything you can imagine. There are many wellness facilities, including a swimming pool, jacuzzi and a sauna. They also provide entertainment and several outdoor activities. All of these hotels are on walking distance from the beach, as well as the famous nightlife area, called The Strip. After the busy summer season of last year, we recommend to book your hotel now, as it will probably sell out. Below you can find a map with the location of hotels near Praia da Oura. By changing the date of your holiday, the map will show you the current prices. Senhor Frogs Pizzeria. 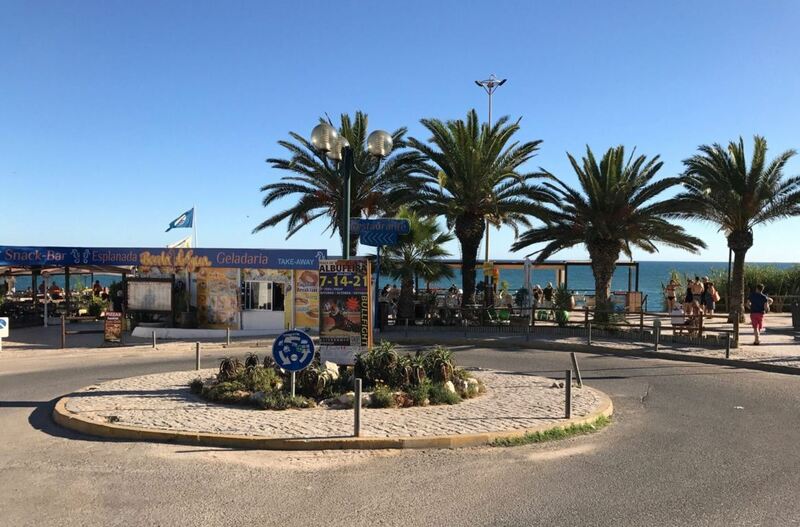 This pizzeria is located not far from Praia da Oura. It is considered to be one of the best pizzerias in Albufeira. The pizza is great and there are many options. Curry Leaves. This Indian restaurant offers perhaps the best curry of Albufeira. Their food is full of flavour. Definitely worth a try. Golden Garden. 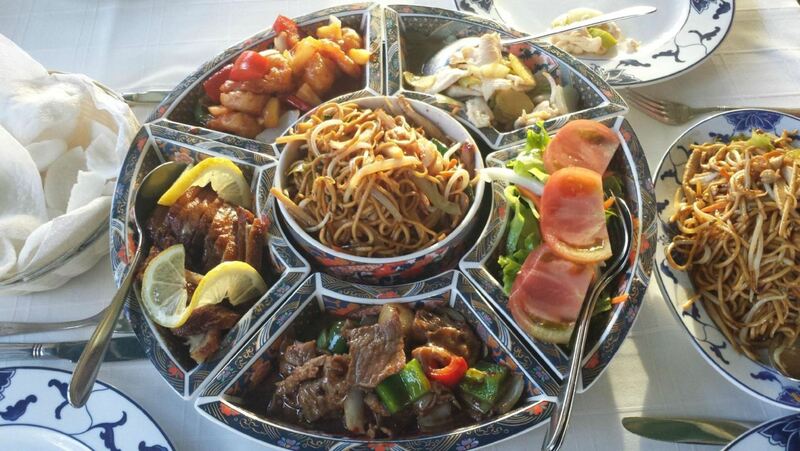 This Chinese restaurant has excellent food and provides good value for money. The portions are really big, so you won’t leave hungry. If you appreciate delicious pastries and cakes, or would like to have a coffee in one of the most traditional cafes of the region, try pastelaria Martinique Velha. When you are in Albufeira, you have many different excursions you can take nearby. These excursions show a different side of the Algarve. For example, a boat ride across the Algarve coast offers stunning views. It is highly recommended to take at least one excursion when you are in Albufeira. Below you can see some of our recommended tours. 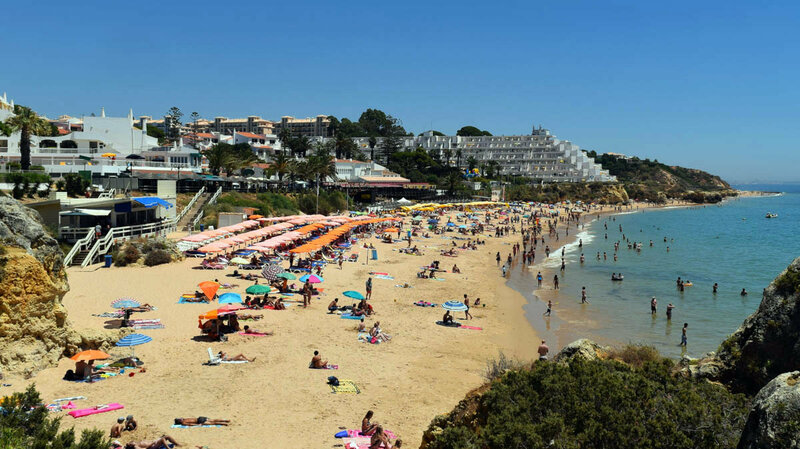 As most beaches in the Algarve, Praia da Oura is a blue flag beach, meaning that it fulfills the best standards in terms of safety and facilities. There are many facilities around the beach, such as toilets (freely available). Also it is possible to hire parasols and sunbeds. For those who prefer to buy beach gear, there are many different shops around the beach. There is also free wifi available near the beach. The beach is situated at the bottom of a steep hill, which might make it difficult to reach the beach by wheelchair, but not impossible. For people with walking difficulties, it might be better to take a taxi or tuk-tuk to the beach.